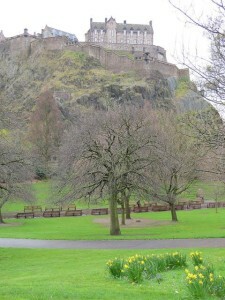 We got back from Edinburgh last night…oh, what a glorious time we had…and what a splendid city! We both fell in love with it and would love to move there immediately…But we have six cats that don’t travel well at all…oh, and our jobs, of course! 😉 Oh well…we’ll go back some day…for sure! The weather was a big topic of conversation. Everywhere you went. And yes, at times the weather was a wee bit on the wacky side…it would rain or even pour, then the wind would blow the rain clouds away, sometimes within minutes, and the sun would come out…Then it started all over again–rain, sometimes even hail, then sun…and always accompanied by lots and lots and LOTS of wind. But we didn’t care. We’d come well-prepared for cold, rainy weather. And of course both Stefano and I are cold weather people, so we were fine. As for my blog reader, well, what can I say? She was absolutely fabulous. 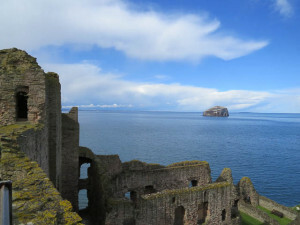 She picked us up on two different days and drove us to Bass Rock (North Berwick) and also two castles, of which our favorite was Tantallon (see photo on left), which had amazing views of Bass Rock, where the gannets nest. Then, the day before we left, she drove us to Craigmillar Castle, Rosslyn Chapel and the Scottish border town of Peebles, which is absolutely adorable. We sat on the riverbanks and took photos of all the birds passing by. Glorious. On the way back, she also stopped frequently to let us take photos of the lambs and sheep, a passion of ours (you don’t get to see many lambs in Tuscany…and they’re so adorable! 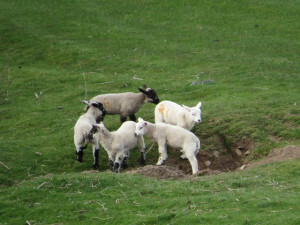 See photo below…doesn’t it remind you of Ring around the rosie?). Today I’ve mostly been going through my 900 plus unread emails (!!! ), so if you don’t hear from me, please take pity! And write to me again, if you need an answer to a question. Well, at one point Dr. Berenson made a rather offhand remark that I found very interesting…and very scary, at the same time. When asked about the hereditary, genetic predisposition for MGUS, he remarked that he has had cases of husbands and wives with MGUS. Husbands and wives?????? He added that that led to the questions: is it infectious, is it environmental? But he didn’t answer those questions. He couldn’t, of course. Infectioussssssss? I really don’t like the sound of that possibility. And I’m sure Stefano won’t, either. Well, it’s something I want to take a closer look at, for sure. Soon! Another interesting link, posted by a friend on Facebook: http://goo.gl/XOIZa It’s a link to a New York Times blogging article, titled “Is organic better? Ask a fruit fly,” and I think all of you will find it VERY interesting…The article mentions curcumin, too, oddly enough. And most of all, take care, everyone! Ciao for now!